Statoil Petroleum AS, operator of production licence 035/272, has concluded the drilling of wildcat wells 30/11-14 and 30/11-14 B. The wells were drilled about six kilometres southeast of the 30/11-8 S (Krafla) discovery and 25 kilometres southwest of the Oseberg Sør facility in the North Sea. The primary exploration target for wells 30/11-14 and 30/11-14 B was to prove petroleum in Middle Jurassic reservoir rocks (the Tarbert formation) in two nearby fault blocks. The secondary exploration target was to prove petroleum in the Ness formation in the Middle Jurassic. Well 30/11-14 encountered two gas columns at two levels in the upper section of the Tarbert formation, of 23 and 6 metres respectively, of which 14 and 5 metres have good to moderate reservoir properties. 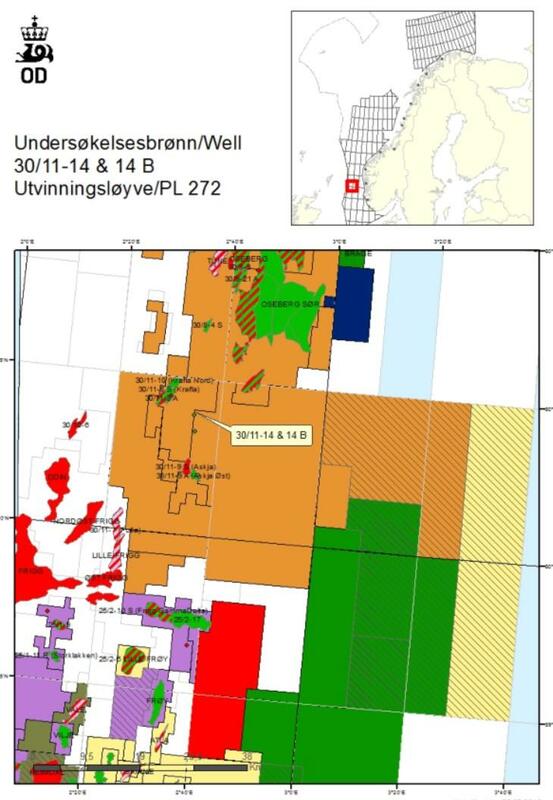 Well 30/11-14 B encountered two gas/oil columns and an oil column at three levels in the upper part of the Tarbert formation; 38, 12 and 13 metres respectively in total, of which 18, 9 and 13 metres have good to moderate reservoir properties. Both wells encountered sandstones with moderate reservoir quality in the Ness and Etive formations, but these were dry. Preliminary estimates indicate that the size of the discovery in well 30/11-14 is between 1 and 2 million standard cubic metres (Sm3) of recoverable oil equivalents and between 2 and 5 million standard cubic metres (Sm3) of recoverable oil equivalents in well 30/11-14 B. The licensees will assess the discoveries together with other discoveries in the vicinity, with regard to a potential development. The wells were not formation-tested, but extensive data acquisition and sampling have been carried out in both wells. Wells 30/11-14 and 30/11-14 B were drilled to respective vertical depths of 3437 and 3343 metres below the sea surface, and respective measured depths of 3438 and 4187 metres below the sea surface. Both wells were terminated in the Drake formation in the Middle Jurassic. The wells are the fifth and sixth exploration wells in production licence 272. The licence was awarded in the North Sea Awards in 2001. The water depth is 107 metres. The wells will be permanently plugged and abandoned. Wells 30/11-14 and 30/11-14 B were drilled using the Songa Delta drilling facility, which will now drill wildcat well 6407/7-9 S in production licence 107 C in the Norwegian Sea, where Statoil Petroleum AS is the operator.